In a momentous event in the history of African Diaspora visual culture studies, more than 200 scholars, curators, independent writers, artists, photographers and other arts professionals from the African Diaspora are gathering to make presentations at the Black Portraiture[s] II: Imaging the Black Body and Re-Staging Histories conference in Florence Italy, May 28-May 31, 2015. Their audience will include numerous other scholars, museum professionals and artists. The conference is sponsored by New York University in association with the Hutchins Center for African and African American Research at Harvard University. Among the battalion of thinkers and creators converging on Florence is art historian Adrienne Childs who views the conference in a particularly special way. Her work on the history of the “blackamoor” in decorative arts has taken her to England, France, The Netherlands and Italy looking for objects and documentation that would tell the story of these curious objects. The blackamoor — usually a coal-black-skinned, turbaned figure of servitude in an opulent context — is the subject of several conference presentations and the accompanying ReSignifications exhibition. Preparing to leave for Italy from Northern Virginia, Adrienne Childs paused for a moment to tell IRAAA+ about her unique perspective on the Black Portraitures gathering. Childs views the blackamoor objects of the late 18th through early 20th centuries as an index of modernity because they represent key elements in the development of the modern Western world: the slave trade which was the economic engine of the industrial revolution, new manufacturing processes which mass produced the back curios, the increased mobility of blacks who travelled to Europe on their own, and print mass media which circulated imagery of black people. Blackamoor objects are still made in Italy today. The ReSignifications art exhibition was inspired by the blackamoor statuary in the Villa Pietra art collections which portray Africans in various states of service and decoration. 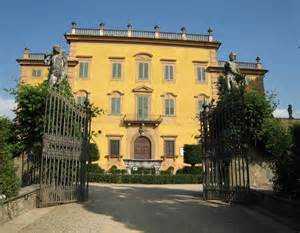 Owned by New York University, the Villa Pietra lodging, research and conference facility is the basis of the NYU Florence program. The art collections of the villa were amassed by the family who previously owned it. Since 2012, artists from Africa, Europe and the United States engaged in residencies at NYU Florence in order to create art in response to the blackamoors, juxtaposing a selection of three-dimensional objects, figurines, and sculptures with reinterpretations and counter narratives from a spectrum of contemporary artistic angles. 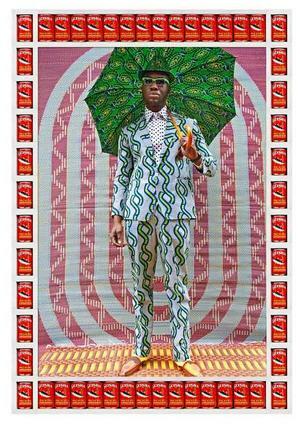 Artists contributing work include Carrie Mae Weems, Fred Wilson, Mickalene Thomas, Zanele Muholi, Omar Diop, Peju Alatise and Mary Sibande, among many others. ReSignifications will be on view at Villa La Pietra, Galleria Biagiotti, and the Bardini Museum in Florence. The show was organized by Awam Amkpa, a Nigerian playwright, director, filmmaker, scholar and New York University Professor of Drama and Africana studies. Coinciding with the exhibition’s opening, the Black Portraiture[s] II conference is the sixth in a series of highly successful conferences hosted by New York University (NYU) and Harvard University. With more than 40 panels and presentations on a variety of cross-disciplinary topics, Black Portraiture[s] II presents a broad assessment of the black body around the world. Conference participants include Holly Bass, Sanford Biggers, David Bindman, Mary Schmidt Campbell, Cheryl Finley, Vera Grant, Mario Gooden, Todd Gray, Sharon Harley, Lyle Ashton Harris, Salah Hassan, Kellie Jones, Monica Miller, Joan Morgan, Mark Anthony Neal, Charmaine Nelson, Simon Njami, Ebony Patterson, Fahamu Pecou, Hank Willis Thomas, Michele Wallace, Adrienne Childs and numerous others including many promising and accomplished younger scholars. More than 700 participants are confirmed to attend. Art historian Adrienne Childs views the blackamoor as a complex object because they question notions of racism as well as confirm them. 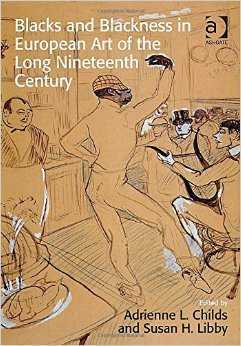 While they are cast as figures of servitude (the racist aspect) they are very different from the comical caricatures and grotesque depictions of black by 19th century white Americans. Often bejeweled and gilded with their African features delineated in an admirably realistic way, the blackamoors are exotic figures in luxurious settings. Instead of slaving in rags in sun-scorched fields and scrubbing floors, they lounge among fine furnishings, serve gorgeous fruits and sumptuous foods and play roles in sexual intrigues. 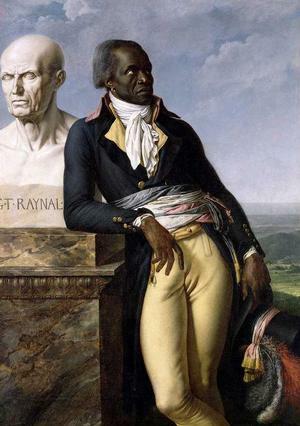 In contrast to the blackamoor, a prevalent form in decorative arts, the black figure in 19th century painting are often valorized, not exoticized, as can be seen in the paintings by Anne Louis Girodet de Roucy-Trioson and Marie-Guillemine Benoist shown here. 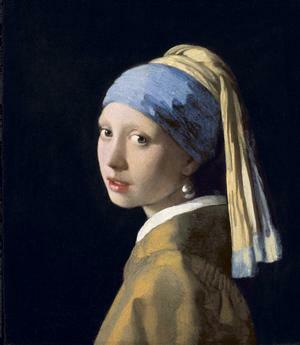 Some of the ReSignifications artists directly quote European artworks, for example Awol Erizku's Girl with Bamboo Earring take on Vermeer’s Girl With a Pearl Earring. 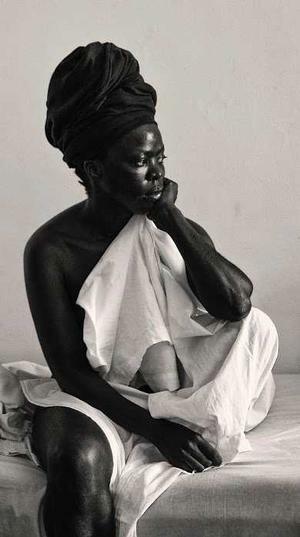 Not a direct quote, but Zanele Muholi’s head-wrapped woman draped in white sheet (shown below) is very reminiscent of Benoist’s Portrait of a Negresse. 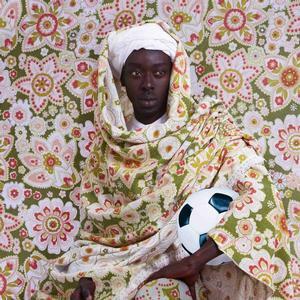 And the florid embellishments of the Rococo art and design are a perfect fit for the similarly ornate styles of contemporary artists such as Omar Victor Diop, Hassan Hajjaj, Ebony Patterson and Mickalene Thomas. The conference organizers are Ellyn Toscano, Deborah Willis, Awam Amkpa, Manthia Diawara, Robert Ernest Holmes and Ulrich Baer, New York University; and Henry Louis Gates, Jr., Harvard University. 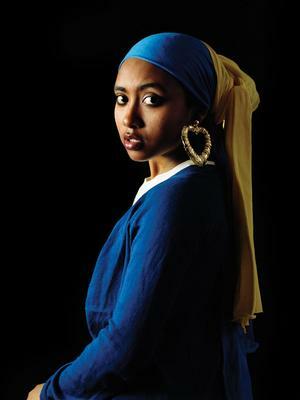 “Black Portraiture[s] II invites all in attendance to conduct a crucial reading of the black portrait while challenging conventional perspectives on identity, beauty, cosmopolitanism, and community in Africa and its diaspora,” says Deborah Willis, chair of the Department of Photography and Imaging at the NYU Tisch School of the Arts. “Beauty and authenticity, desire and repulsion, power and submission all come into question, constituting an invaluable resource to fulfill the intellectual mandate to produce critical knowledge about African identities and representations." With the support of NYU Faculty of Arts and Sciences Trustee Robert Holmes, Jr., artists have taken up residence at Villa la Pietra to explore contemporary interpretations based on the permanent collections of the Villa’s former owners, the Acton Family, who bequeathed the estate to NYU in 1994. Robert Holmes began collecting art when he was a young attorney and his long-time art patronage includes being a contributor to the premier issue of the IRAAA print journal in 1976. The Black Portraiture conference was arranged to coincide with the international art exhibition of the Venice Biennale. Okwui Enwezor, the director of the Biennale art exhibition, was a featured speaker at the 2002 planning session at Harvard that led to the organization of the visual art conference series, of which Black Portraitures is a part. The conference series was launched in 2004 by Henry Louis Gates, Jr., who is now Alphonse Fletcher University Professor and Director of the Hutchins Center for African and African American Research at Harvard University. The 2013 conference, held in Paris, drew over 400 attendees and panelists. All contemporary art shown in this article is part of the ReSignifications exhibition and courtesy of the artists and New York University. Visit here for the full Black Portraiture[s] II conference schedule, and here for more information on the ReSignifications exhibition. 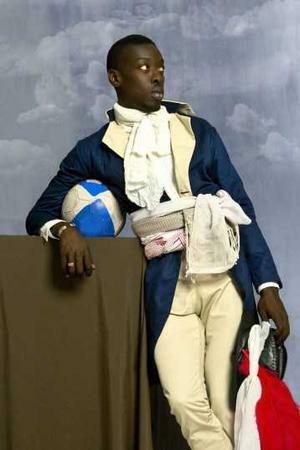 IRAAA+ coverage of the 2013 Black Portraiture[s] conference, "The Great Gathering in Paris," is here.